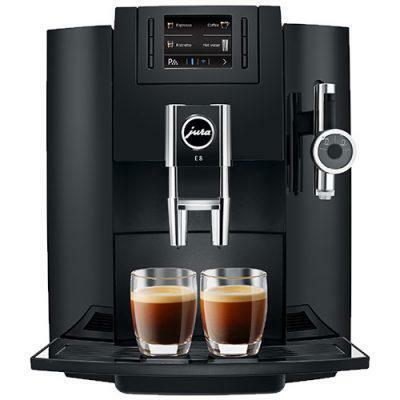 The Jura E8 coffee machine brings the convenience of a bean to cup suited to the home or small to medium office. Furthermore it adds a one touch feature to include frothed milk in. Frequently Jura have a habit of taking the chassis of an older model that has been discontinued and updating the insides with new tech. Consequently Jura then launch a new model. Specifically this is the case with the Jura Impressa E8. Given that the old Jura C9 chassis is re-deployed in this model proves it was a success. Add to that now there is a TFT screen, the new model grinder. As well as the new brewing method Pulse Extraction Process (P.E.P.®), and you have a great machine. Especially relevant to the coffee drinker that has to have milk then this is the model for you. It doses frothed milk into an espresso style brew for you. 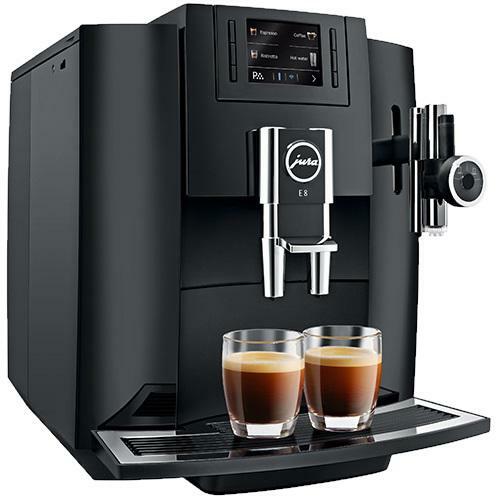 So that with in a single touch you can get a latte or cappuccino, or at least Jura’s interpretation of what that means. A Jura E8 can be used at home or in small offices of around 20 people. Just a note the marketing material claims the machine makes a flat white. Jura make a distinction between flat white and cappuccino by determining when the milk is added. Particularly a cappuccino for them is defined as milk first. While a flat white is define as milk first. Ultimately we at Quaffee feel this is extending the definition should be noted. Height-adjustable coffee spout 65 – 11 mm. Like stats and numbers, dimensions and technical details, then read more E8 Technical Data here. As much as the Jura Impressa E8 is easy to use, you may want to read the manual before you buy one. In addition if you own an Jura E8 and have want an electronic copy of the manual. Hence here is the E8 Instruction Manual for you to download and read.